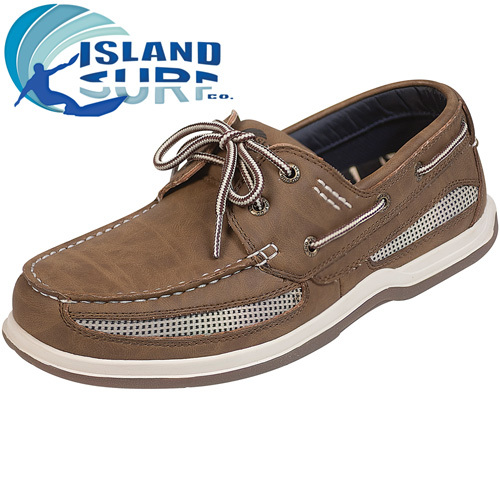 A rare in-season closeout on Island Surf boat shoes - set sail in style for less! Aren't you glad you waited to buy the boat shoes you need for this season? You'd expect to pay much more for these Island Surf shoes, but thanks to one of our shoe buyer's sharp negotiating skills, you can wear a pair for much less! And just look at the quality. The upper is crafted with ISEON, a durable, flexible and water resistant material and side mesh panels for a classic boat shoe look. Inside, they have a removable padded sock liner and a fabric lining to keep feet cool and comfortable. Also features a high quality rubber outsole for exceptional traction on wet, slippery surfaces. Mens wide width size 8.